In May we received a new Bible study from our translators called Déterrons Le Passé, which is the Discover 4 Yourself® (D4Y) study called Digging up the Past, covering chapters 3–11 of the book of Genesis. 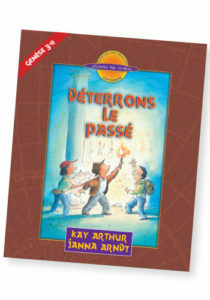 This is the second children’s study that has now been translated into French. It’s our hope that we’ll have the entire book of Genesis translated into French for children’s ministry by the end of 2017. These studies are being used all over the world to teach children how to discover the truth of God’s Word for themselves through the inductive Bible study method. In July here in Brantford, we’ll be running our summer Vacation Bible School, training interns to teach children how to use these materials. We’re also bringing in Janna Arndt, the author of these Discover 4 Yourself studies on Saturday, July 15, 2017. It’s vital that our ministry raise up leaders who will commit to establishing the next generation of Precept students in the Word of God early in life. Studies like Genesis are so important for children, because the debate on creation vs evolution will continue until Jesus returns. If children can’t believe that an Almighty God has the power to speak the world into existence, how will they ever believe that the same God came to earth, died on a cross, and rose from the dead? A proper view of Genesis leads to a proper view of God and the fruit is a solid faith in Jesus. 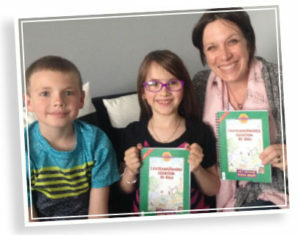 In France, the study L’Extraordinaire Création De Dieu, or God’s Amazing Creation, is now being used by Careen, the children’s coordinator at one of the biggest evangelical churches in Paris. Last week, Careen sent us a picture of Colleen and her two children who have started using the material in their home group. Colleen and her husband Erik, who are missionaries in France, love the study and want to introduce more children to these new French studies. Solid Bible-based children’s curriculum is very hard to find in the French language. We are so thankful that God has provided the funds to translate the first three studies. Careen will start using these studies in September for the church’s children’s program in Paris. “I taught the grades 4-6 class Jesus in the Spotlight, in which my daughter was in grade 4 and 9 years old. This class went very well and the kids really engaged in this type of study. They enjoyed discovering for themselves the answers within the Scripture text to the 5 Ws and H questions asked. The most fun for them was the marking and then looking for the key words as they answered the questions. While it was more challenging for some, the other children would be encouraged to help each other. The memory verse activities were also done with much enthusiasm. This past September I started homeschooling. My daughter, Hannah, who is now almost 12, is well into her second study since the end of September. She has completed God’s Amazing Creation and is currently doing Joseph—God’s Superhero. When I asked Hannah the other day what she liked best about these studies, she said the activities. She also said that she liked the questions that the book asked about how she deals with things that were talked about in the study. How she could apply the truths she learned and what it could look like in her life. I asked Hannah if she thought the study was too simple and she said no. 14% or 1/7 Christians say they read their Bible at least once a week. The majority of Christians read it seldom or never. 2/3 or 64% of Christians surveyed believe that all major religions share the same teachings. Church attendance is directly related to the individual’s confidence in the Bible. Those who believed that God’s Word is His very voice are more likely to be in church on Sunday. Scary isn’t it? Do you see why Discover 4 Yourself materials are so important? A generation has lost confidence in the Word of God and as the Word of God tells us, we must guard the treasure and entrust it to faithful men who will teach others. 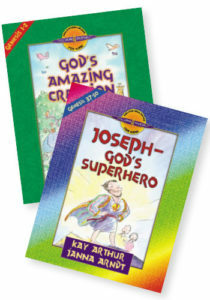 You can partner with us as we raise up and train children in the Word of God using these children’s materials. Your gift to Precept Ministries will be used to translate more materials into French and provide training for parents, Sunday School teachers, and Children’s pastors to effectively use these materials in their homes and churches. Please prayerfully invest in this ministry as we establish children in God’s Word. 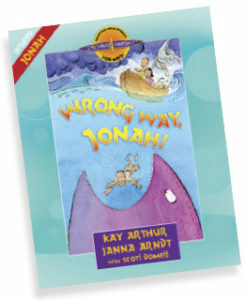 With your donation, we will send you our bestselling children’s study Wrong Way Jonah to pass on to a child, grandchild, or a family that you know who will benefit from this study. Maybe you’ll use it to lead your children or grandchildren through this summer. School is out and children have plenty of time now to study. Pray for our Children’s Training Workshop on July 15 with Janna Arndt and for our Summer VBS here at the office being held July 24–28. Please remember to pray for our summer interns as well; they are high school and college students who will be learning how to disciple others in God’s Word all summer.